"You're a loser, Eddie," the black, goopy, alien symbiote calling himself Venom tells Eddie Brock (Tom Hardy). And we agree. Then the symbiote adds, "On my planet, I'm a loser too." And we're like, "Huh? That's... weird." Then again, this is a movie where Eddie is placed in an MRI machine, which is torture to Venom, and the doctor asks "Eddie, are you okay? Are you okay, Eddie?" He's been hit by, he's been hit by a smooth symbiote. In director Ruben Fleischer's Venom, weird works and that in and of itself is weird. Venom is a bizarro buddy comedy crossed with a superhero movie crossed with a body horror alien invasion movie. As Eddie Brock, Hardy plays a swarthy, unethical San Francisco TV journalist who betrays his lawyer fiancee Michelle Williams in order to humiliate and expose sinister billionaire Carleton Drake (Riz Ahmed), head of the sinister Life Foundation. Instead, Eddie is exposed, loses his job, his fiancee, and six months later, he becomes even more swarthy while basically remaining the same amount of unethical. And then, this down-and-out loser meets Venom, a down-and-out loser symbiote from outer space. It's the worst thing that ever happened to Eddie. Or the best? Not sure, jury's out. But let's see these two best buds make a go of it, shall we? Eddie was right to suspect Carleton Drake, though. Drake is a little like Adrian Veidt in Watchmen; he's a very rich, smart man who has a terrible plan to save the world. Trouble is, Drake hates humanity, though we can kind of see his point; just like in Shane Black's The Predator, the real enemy in Venom is climate change. The Predator estimated the Earth was two generations away from becoming uninhabitable. Venom moves that timetable up to one generation and Drake puts all the blame for this squarely on people. But his solution to our extinction ain't great: his space shuttle (piloted by astronaut John Jameson, hero son of Daily Bugle publisher J. Jonah Jameson), finds a comet containing alien life forms and brings four of the symbiotes back to Earth. One escaped during re-entry and crashed the ship in Malaysia. The Life Foundation recovers three of the symbiotes and brings them back to their labs right next to the Golden Gate Bridge. The fourth symbiote murders and body-snatches Malaysian women until it finds its way onto an airplane to SF. Meanwhile, Life Foundation scientist Jenny Slate (who did ADR so that she pronounces "symbiote" properly, unlike in the trailer) has serious ethical qualms about how her boss kidnaps homeless people and exposes them to the symbiotes. The aliens try to bond with the human guinea pigs but quickly eat up their organs and murder them. One of the vagrants killed is Melora Walters, who has fallen on really hard times in the 20 years since Magnolia. Slate betrays Drake by clueing Eddie Brock in on the murders happening at Life, but Eddie being Eddie, he goes where he shouldn't go and has a meet-cute with Venom. They end up bonding in all the worst ways. Or best ways? Not sure, jury's out. Eddie-Venom is a new kind of Odd Couple. Their banter is the highlight of the movie and man, is it weird. 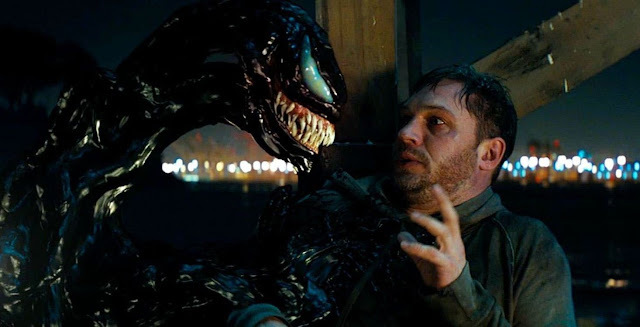 Hardy performs as Eddie being possessed by Venom and he portrays Venom's voice, talking to him in his head and sometimes manifesting physically as a black, jacked-up, toothy-faced monster. And for a homicidal alien freakshow, Venom sure is sensitive. He gets upset every time Eddie refers to him as a "parasite" and the first time he climbs to the top of a skyscraper like Spider-Man and looks out over San Francisco Bay, he decides Earth isn't so terrible and wants to stay. Venom also wants to reunite Eddie with his ex-fiancee; the alien monster playing Dr. Phil, giving Eddie romantic advice, and urging him to apologize to her is the weirdest part of the movie. No wait, Eddie sitting in a lobster tank at a fancy restaurant and eating a live lobster is the weirdest part. No no, hang on, Venom possessing Michelle Williams' body, turning her into She-Venom, and then making out with Eddie as he oozes back into Eddie's body is the weirdest. Of course, the fourth symbiote makes it to San Francisco and bonds with Carleton Drake. It calls itself Riot, and that's weird too. So wait, their names were Venom and Riot before they came to Earth? Riot's plan is to fly a new Life Foundation spaceship back into space, fetch a bunch more symbiotes, and then come back to invade and conquer Earth. Venom decides this isn't a good deal for him or his new human friend so he and Eddie go off to stop Riot. The battle between two disgusting, monster-faced, alien goopballs is brief but gross, but fortunately for Earth, good(?) triumphs over evil and Eddie/Venom kill Carleton/Riot. In the end, all's well that ends well. Eddie and Venom settle into their new relationship, somehow Eddie is a reporter again, he and Michelle Williams are cool again, and Venom gets to stay on Earth but he can only murder certain kinds of people. So, great? What about climate change, are we doing anything about that? Nah, that's not really Venom's problem, so it's fine. In the end, we walk out of Venom hoping E&V can make it together in this crazy old world. Venom is a good time superhero movie if you can get on board with the movie's Looney Tunes-logic and Tom Hardy's gonzo Jim Carrey-in-The Mask performance. But like Gretchen Weiners trying to make "fetch" happen, Venom makes a serious case for replacing "So bad, it's good" and making "So Venom, it's good" happen.